Cortijos Nuevos is a small town in the Parque Natural Sierras de Cazorla, Segura y las Villas. This natural park is one of the largest in Spain, and while it lacks the drama of some other areas, it has a subtle beauty and a strong feeling of remoteness on some of the smaller roads. There is some wonderful cycling in the area, the speciality being beautiful long hills. Looming over the town is the mass of El Yelmo with its bare summit and communication aerials. We stayed in a fantastic Airbnb in Cortijos Nuevos and started our rides there, so that is how I describe them. A tough climb, steep and varied, on a wonderful road surface, with several kilometers of consistent 10-11% gradient. The whole ride is 54.3 km with 1,530 meters (5,020′) of climbing. From the south end of Cortijos Nuevos head towards the castle-topped hillside town of Hornos on the A-317. You reach Hornos after 5.6 km with 202 meters of ascent and 88 meters of descent. 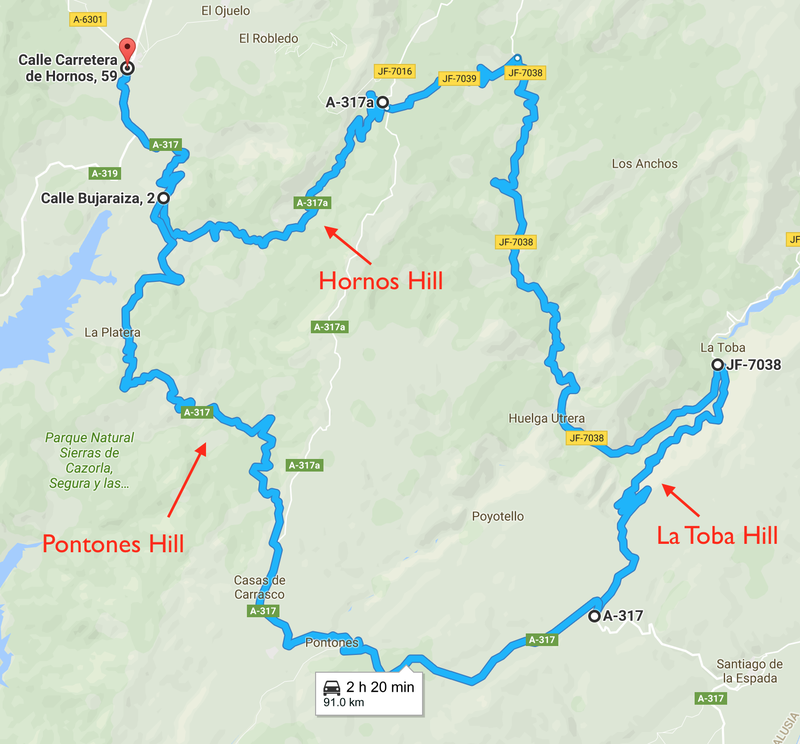 If you choose to start in Hornos, simply subtract 11.2 km and 290 meters of climbing from the totals. From Hornos continue on the A-317. 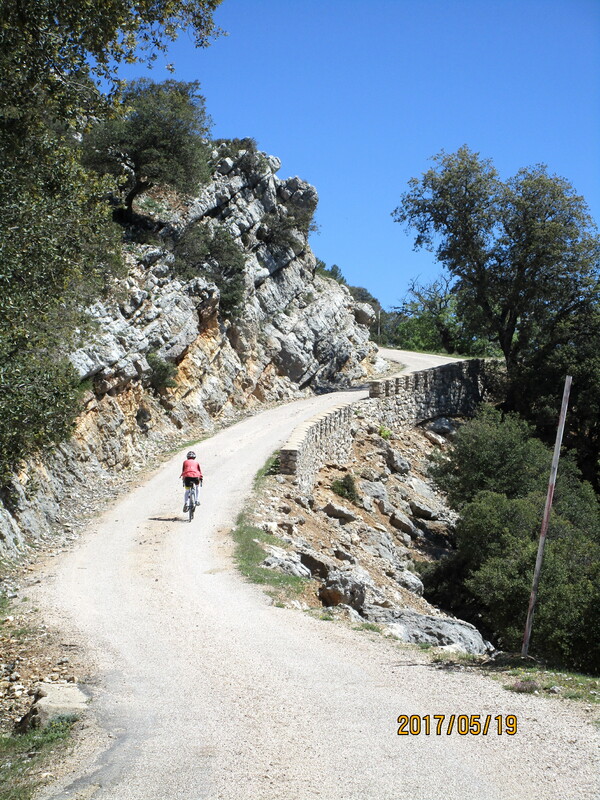 A long sweeping downhill leads to rolling terrain and at km 10.6 you reach Hornos El Viejo. Then the wonderful climbing starts. The next few kilometers are pretty consistent 10-11%. There are a few places where the angle eases, and a few spots where it increases briefly to 12 or 13%. Then at km 14.9 you reach the top of this first section after 303 meters (994′) of tough climbing. The next two kilometers are very steep rolling terrain, then at km 17 you start the next long uphill. This second section is less consistent that the first section, and while it hovers around 10-11%, there are more sections of 12-13%, and more sections of considerably easier climbing. You finally top out at km 24 (just above KmM 35) at an intersection. You can either turn round here or continue down for another 4.2 km to Pontones. This next slightly downhill section is high tundra, and just before Pontones you enter a small canyon with rock walls. Turn round at km 27.2 in Pontones and ride back, enjoying the steep sweeping turns on the downhill sections. Climbing into Hornos will give your legs their last real test as this is the steepest part of the whole ride 😀. A wonderful loop that climbs the peaceful hill above Hornos, traverses a shelf high above a deep valley, then climbs to the top of the dramatic El Yelmo. 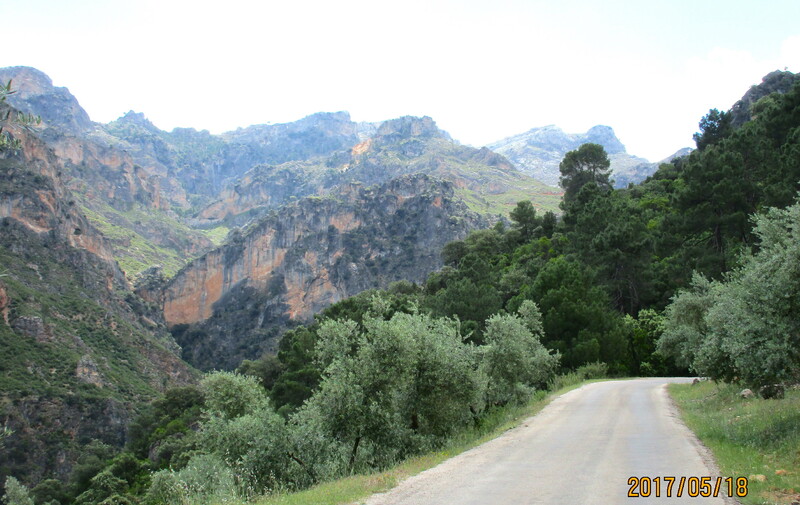 The loop from Cortijos Nuevos is 40 km with 1,169 meters (3,835′) of climbing. 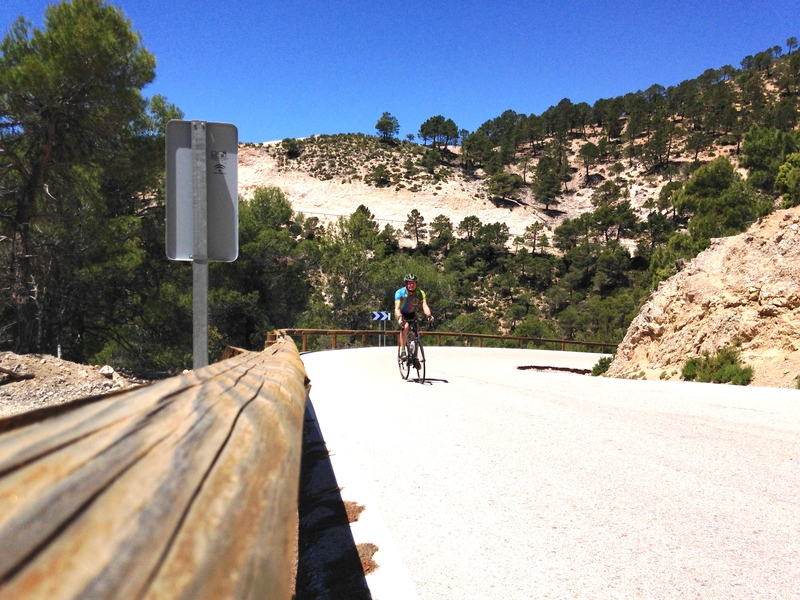 Starting at the south end of Cortijos Nuevos, ride along the A-317 to Hornos, which you reach in 5.6 km. In Hornos, turn left up the A-6305 towards Capellanía and Río Madera. This hill is much less steep than some of the other climbs in the area and while it has some 10% in places, much of the climb is 6% or less. It’s a very quiet and peaceful with a decent road surface. At km 18.1, after climbing for about 12.5 km with 552 meters (1,811′) of ascent, you reach a T-junction. Turn left and head gently downhill for just over 1 km and at km 19.3 turn left by a building. The road quality deteriorates drastically for a short distance then improves, although the road is rougher than the climb you just did. Follow this road along a spectacular shelf high above the valley. Just before km 21 turn right for the final climb of 387 meters (942′) to the top of El Yelmo. A wooden sign says 4 km to the top, although it’s slightly less. The road gets rougher again, and though it starts almost flat the gradient soon increases to about 9%. As you get higher the views get better and more dramatic and finally you are faced with a section of 13-16% before it eases down to 10-11%. Welcome to the top and spectacular views. Head back down the upper section then turn right at the intersection. Ride down the rough road through the trees, paying close attention as there are some holes in the road. Once you reach El Robledo the road becomes beautifully smooth again. Continue steeply down to El Ojuelo, through this, and on to Cortijos Nuevos. The other, more direct way to ride El Yelmo is up through El Ojuelo and El Robledo. You can find a description of doing this ride here. This is an amazing loop on quiet and remote roads, with two big climbs and plenty of rolling terrain. The whole loop is 90 km with 2,186 meters (7,172′) of climbing. The first big cimb, Hornos Hill, climbs 552 meters (1,811′) and the second big climb, La Toba Hill, climbs 562 meters (1,844′). 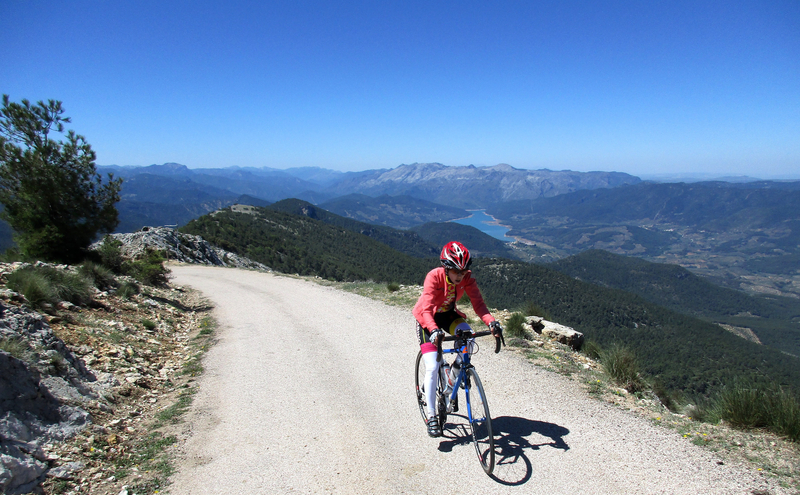 The rest of the elevation gain comes from the climbs to Hornos and the rolling terrain. Turn right then in about 100 meters turn left on the JF-7039 towards Río Madera. It’s now just over 22 km to La Toba, starting with a delightful 5 km descent which weaves through a pretty valley to Río Madera. Just after Río Madera at km 23 you reach a T-junction. Turn right following the sign for La Toba. Continue along the rolling road, passing several tiny villages, until you reach the turnoff for La Toba at km 41.5. La Toba sits beneath spectacular cliffs that loom ever upwards. Strangely, it appears that La Toba doesn’t want visitors as the road leading to it is very rough and gravelly. Fortunately this road is very short and in about 100 meters you cross a bridge and reach the T-junction. You finish the big climb at km 49.6, then the road rolls across a high limestone plateau until you reach the A-317 at km 53. Turn very sharp right and follow the A-317 for about 10 km into Pontones. If you’ve already done the Pontones Hill climb you know what to expect back to Corjijos Nuevos. If you haven’t be prepared for a wonderful fast ride down the steep smooth road, with a few steep climbs to test your legs. 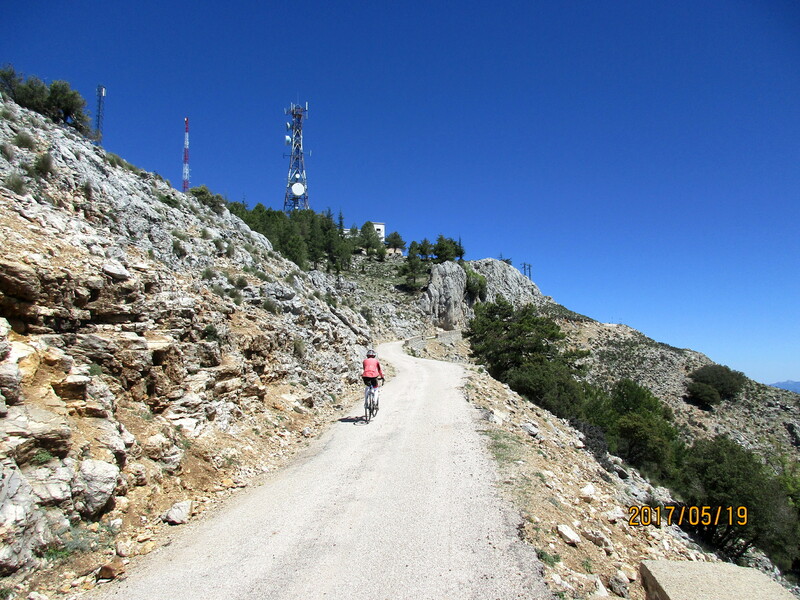 Although this is not as tough as some of the other climbs, it features 12 switchbacks up a steep hill covered with olive trees. However, there is more climbing getting to the switchbacks and back than on the switchbacks themselves. The whole ride is 50.2 km and 1,146 meters (3,760′) of climbing. The switchback section is 4 km long and climbs about 340 meters (1,115′). From the south side of Cortijos Nuevos head south for 1.6 km then turn right on the A-319 to Tranco. This part of the ride is considerably more rolling than you might imagine. At km 13.6 you reach Tranco, with its big dam and Centro Náutico. Turn right on the A-6202 towards Villanueva and follow the rolling road along the side of the canyon, to just past a spectacular cliff on the left. After 5.4 km, at km 19, turn left to Charco del Aceite then in a few hundred meters turn right and cross the bridge. Continue up the lush canyon with high cliffs on both sides. At km 20.4 the road turns right and starts switchbacking up the olive tree studded hill. The climb starts with lots of 9-11%, then as you climb higher the gradient eases. After 12 switchbacks the road heads straight back then tops out at km 24.4. I turned round here. However, the road continues downhill for a way, then continues to climb for another few kilometers. For information on the whole climb, click here. 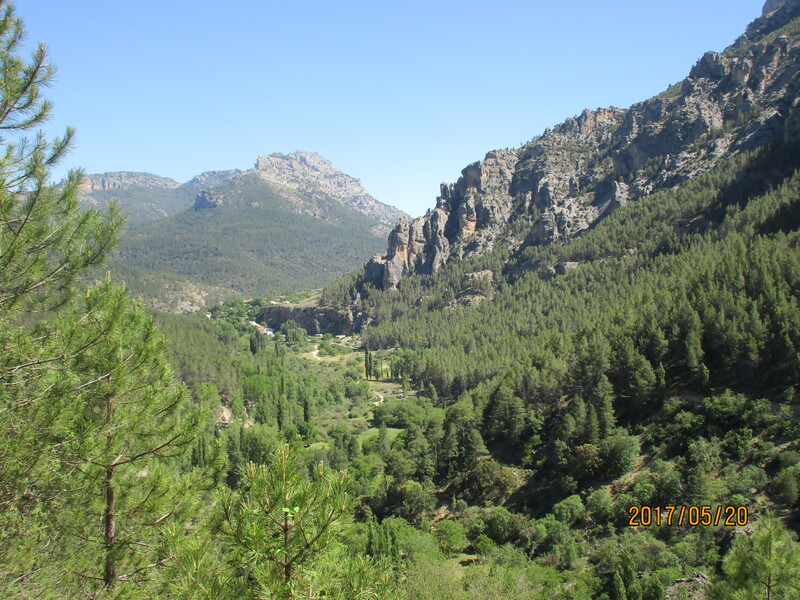 Cool Sierras offers cycling holidays in the Parque Natural Sierras de Cazorla. It was on their web site that I learned about the cycling and the specific climbs, and it is thanks to this web site that we chose to come to Cortijos Nuevos.